I just finished Ludum Dare 27 this last weekend. It is a game jam where you have 48 hours to design and code a game based on a theme that is chosen by all participants. This time the theme was 10-seconds, so I got an opportunity to make something that I’ve been thinking about for a while. Pick the wanted robot out of a lineup of robots within 10-seconds, but as you beat each level, the robots start to get more similar in their appearance. 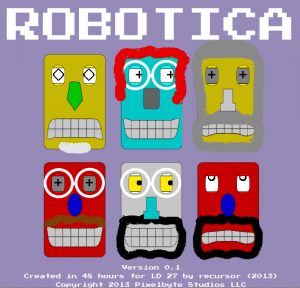 If you like find the hidden object games, then you should check out Robotica. Be sure to read the Background and Instructions to get the full effect.